My secret recipe. It does have a lot of cheese in it, but when you use low-fat cheese, you reduce the fat content considerably. I wouldn't recommend no-fat cheese, but it is just as delicious with low-fat cheese as the full-fat variety. 1) In a large bowl, stir together the first 7 ingredients. Add optional ingredients, if desired. 2) In medium bowl, stir together ricotta cheese, egg and the 1 tbsp dried parsley (or ¼ cup fresh parsley). 3) Cook lasagna noodles a couple of minutes less than package directions. 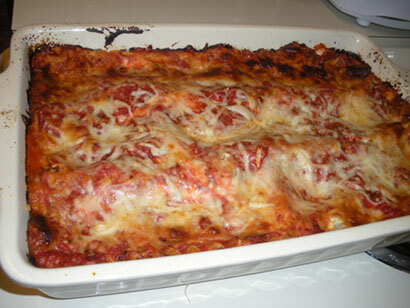 4) Layer a large lasagna pan (9 inch by 13 inch and deep) with ¼ of the sauce. Then add 3 or the cooked lasagna noodles, side by side. 5) On top of the first layer of noodles, spread 1/3 of the ricotta mixture and then add ¼ of the sauce and then 1/3 of the mozzarella and 1/3 of the parmesan. 6) Repeat with two more layers. Top layer of the dish should be mozzarella and parmesan. 7) Cover with aluminum foil and bake at 350 degrees for 25 minutes. 8) Remove foil and bake another 20-25 minutes or until bubbly brown on top. Feeds 6-8, depending on your appetite.